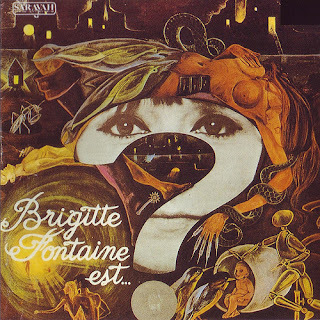 Brigitte Fontaine's first album, arranged by Jean Claude Vannier (who had also done arrangements for Serge Gainsbourg), is her most normal and accessible record. It's still not terribly normal by pop standards, its arty songs dressed up with period Continental orchestration and quirky melodies and vocal deliveries. These can both hark back to Edith Piaf-styled material, or look forward to slight avant-garde/experimentalism. At times it sounds like the kind of thing Francoise Hardy might have done had she continued to develop along adventurous lines and keep pace with progressive pop and rock trends in the late '60s. In fact, songs like "Une Fois Mais Pas Deux" sound rather close to Hardy's best late-'60s material, but Hardy would have never done anything as goofy as "L'Homme Objet," with its music-box backing, or as odd as "Eternelle," with its tribal male backup vocals and rhythms, and "Blanche Neige," with its overdubbed tropical bird effects. Thanks for this - I heard her more avant-garde music, and I was very curious about her more accessible pop tunes. These are wonderful! Many thanks.